Is ePrescribing a Niche Worth Moving Into? By Dmitry Garbar, partner, Belitsoft. Errors in prescription can happen for various reasons, like pharmacists’ incompetence, miscommunication between clinicians or doctor’s bad handwriting. Among medication errors, prescription inaccuracy is one of the major causes of concern for healthcare professionals. Today’s most effective technological solution is to implement an electronic prescribing system. With the help of e-prescribing software, prescription errors can be prevented in 80 percent of cases. It is also an actual solution for the opioid epidemic that puts Americans’ lives at risk. The results, indeed, are impressive. But at the same time, eRx systems are considered inconvenient and costly for small practices. We’ve tried to explore e-prescribing market and identify the main problems of widespread system adoption. Electronic prescribing (eRx) is a system that enables healthcare providers to generate digital prescriptions and send them to pharmacies directly from the point of care. e-Prescribing, in fact, improves accuracy, enhances patient safety and quality of care since there is no handwriting. Systems integrated with EHRs, which include comprehensive patient data. Stand-alone systems, which means that they can be used only for e-prescribing. Some eRx systems offer advanced features that allow healthcare providers to access generic medication alternatives, insurance benefit info, and patient medication lists and histories. These extra features have the potential to improve physicians’ decision-making capabilities and increase the use of e-prescribing systems. A prospective EHR vendor has to comply with the regulatory requirements of their customers and know how to develop e-prescribing software. But is investing in eRx worth it? According to the recent Transparency Market Research, the global market for e-prescribing is expected to reach a CAGR (Compound Annual Growth Rate) of 23.5 percent from 2013 to 2019. Persistent Market Research estimated that the market will reach $887.8 million in 2019. While Europe holds the largest share in e-prescribing market, the US turned out to be the fastest-growing region. Indeed, increasing adoption of healthcare management software and extensive use of health IT for patient engagement are the key factors in industry growth. 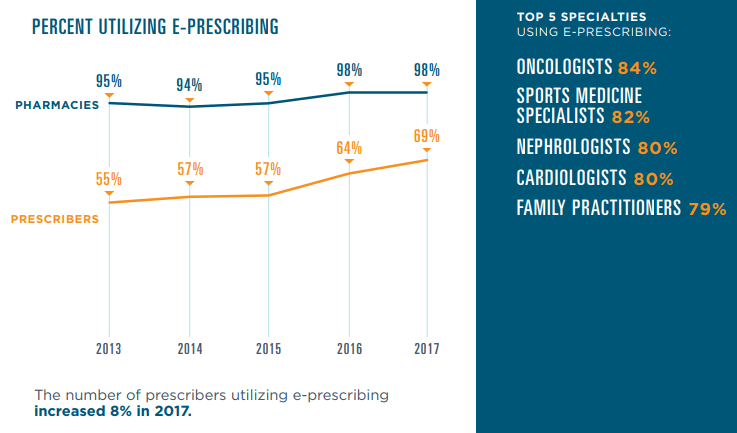 Furthermore, electronic prescribing is a requirement for healthcare providers aiming at achieving meaningful use under the Medicare and Medicaid EHR Incentive Programs. What do prospective vendors need to begin with electronic prescribing? Contact NCPDP for transaction standards. Certify with appropriate network business partners. Contact CCHIT for certification requirements. Major players on e-prescribing market: Cerner Corporation, DrFirst, HealthFusion, Surescripts, Allscripts Healthcare Solutions Inc., Aprima Medical Software, eClinicalWorks, athenahealth Inc. and Relayhealth Corporation. To show what usability results you can expect, we have chosen the case of Surescript as an “open-source” company. Surescript is a VA-based operator of a nationwide electronic network for prescription-related data and information. Its platform connects EHRs, pharmacy benefit managers (PBMs), pharmacies and clinicians, plus health plans, long-term and post-acute care organizations. Their 2017 National Progress report shows that 13.7 billion secure health transactions took place via the Surescripts network including 1.74 billio e-prescriptions. This is a 26 percent increase from 2016. This improvement was owing to five key elements: Drug Description, Representative National Drug Code (NDC), RxNorm, Structured and Codified Sig and Potency Unit Code. 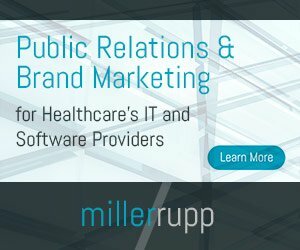 Moreover, the network connected 1.47 million healthcare professionals — 13 percent more than in 2016 — with secure patient data for 233 million Americans, or 71 percent of the population. Various government initiatives which focus on reducing medical errors, and the need to cut escalating healthcare costs foster the growth of the eRx market. The increasing cooperation between software vendors and network providers and the vast untapped regions are expected to provide significant development opportunities for industry players. The Centers for Medicare & Medicaid Services (CMS) today released the 2012 Physician Quality Reporting System and Electronic Prescribing (eRx) Experience Report, showing a significant increase in participation in two key programs that allow eligible professionals to earn incentive payments through voluntary participation. The Physician Quality Reporting System (PQRS) has been using incentive payments, and will begin to use payment adjustments in 2015, to encourage eligible health care professionals to report on designated quality measures. The Electronic Prescribing (eRx) Incentive Program used a combination of incentive payments and payment adjustments to encourage electronic prescribing by eligible professionals.